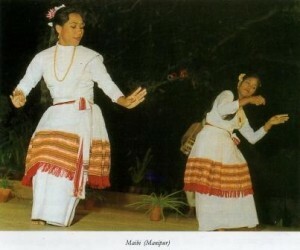 Ariba Pala is another unique form of dance prevalent in Manipur. Lai Haroba menioned above is quite ancient and reflects the Meitei culture that was much influenced by Tantrism. Ariba Pala evolved after Vaishnavism swayed the region around four centuries ago. Both vocal singing and the percussion music of the drum called Pung are the life and breath of Ariba Pala. The group consists of 16 performers. They are divided into two subgroups. One is led by the main singer called Isei Hanba. The other is led by Dubar. The latter group answers the questions asked by the former group. There are two pung (drum) players whose role in the performance is quite important. The performance does not begin until the Mandava Mapu takes his specified seat. He is a very senior artist who has deep technical knowledge about Ariba Pala. He presides over the performance. As soon as he takes his seat the two drummers enter into the arena of performance. They play a few exquisite passages of percussion music. Then the two groups already seated inside the arena in a semi-circular manner, get up and the Isei Hanba begins the invocatory song. The performers imagine that they are in Nabadwip, the birth place of Shri Chaitanyadev, the great Vaishnava saint. It is his life that is depicted by the performers through superb singing, drumming, and dancing. The performance has very subdued elements of theater and it is so controlled and well-knit that it can easily vie with any classical style. Another festive dance prevalent in Manipur is Dhimsa performed by the Kacharis. 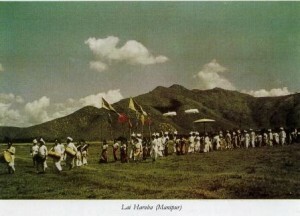 Young boys and girls attired in their traditional colorful costumes present the dance on festive occasions. The boys and girls dance in pairs. Musical instruments used with the dance are : Kharam, a long cylindrical drum with two faces; and Meri, a reeded wind instrument made of wood and with a very widely flared bell at the end like the French horn. It is played continuously without any break for inhalation. The Meri player while blowing the pipe inhales simultaneously. The mastery of playing the pipe comes after long practice. An expert Meri player can play continuously for hours without any break in the blowing.